This year especially, has been a good Christmas season for My First Games, that we must truly give thanks for. But that also meant that I was sooo busy with fulfilling the orders that I didn't have time to do my own shopping! Thus, this past week, I've been trying to squeeze in shopping of my own, as well as the last minute gift wrapping. Isaac and Shawna saw me wrapping gifts, and of course, wanted to help. They have been quite good at helping me hold down the wrappers while I paste the sticky tape, or vice versa. They even found paper and wrapped a gift on their own (teamwork!) - the small blue one right at the bottom of the picture below. 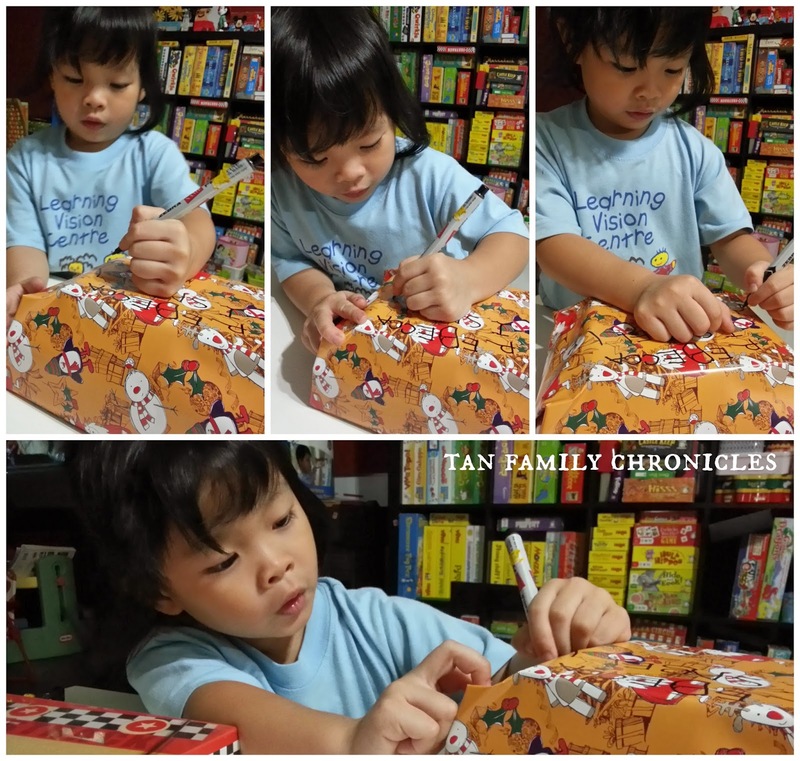 After awhile though, I thought it was easier if I wrapped the gifts on my own while they helped me with the labeling. 4 year old gift labeling! Shawna helped me with labeling too. She couldn't spell like Isaac could, so I had to tell her letters one by one, and she wrote them as I spelt out the names to her, or she copied them from the rough paper I wrote the words on. I love the collage of photos above of her writing with such concentration. I must say she did remarkably well, and she didn't even poke any holes in the wrapper at all. These three gifts were for my three nieces, and because they were board games for them to play together, I deliberately wanted all three names on the gifts so that it was clear that it was meant for sharing. Shawna labelled the orange gift first. She wrote, REBECCA. Next, as she wasn't too good at estimating space usage, she wrote ISABELL before getting distressed at running out of space for the last letter E - which I got her to write over the edge, at the side of the gift wrapper. Next she wrote a tiny N, and I asked "How come your N is so small, when your R and I are so big?" "So that I have more space, Mummy!" Ahhh... nice to know she has been listening. It was a mirror image N though, so she tried again, but it turned out the same way. I told her to just continue anyway, so she left it as it is. She realised she didn't have space for all three of their names and so Asher's name went on the left - in mirror image, backwards, no less - yes, I was busy wrapping a gift and didn't notice this until after the fact! Her W came out as M too. I hope all this mirror-imaging isn't a sign that she is dyslexic! The red present was labelled pretty well. Shawna was apparently so afraid of running out of space again that she started writing the names in small print. I looked over and saw that, so I wrote told her to write Merry Christmas too, since there was space. My little helpful elf was very obliging (good mood, that day) and she did as I instructed, though her W came out as an M again. Next, she wrote NATALIE on the green gift perfectly, then promptly got distracted, proclaimed that her hand was tired, and went missing in action. So yesterday, Isaac the kor kor, came to the rescue and completed the labeling for me. He missed out the middle E in Isabelle, but managed a save by inserting a tiny 'e' between the 'b' and the 'l'. Suddenly, I realised that Shawna had written everything in upper case, while Isaac wrote in a mix of upper and lower case. I guess Shawna hasn't learnt the lower case yet. Notice how Isaac drew a heart shape instead of the 'o' in 'love'? :) His idea, not mine! 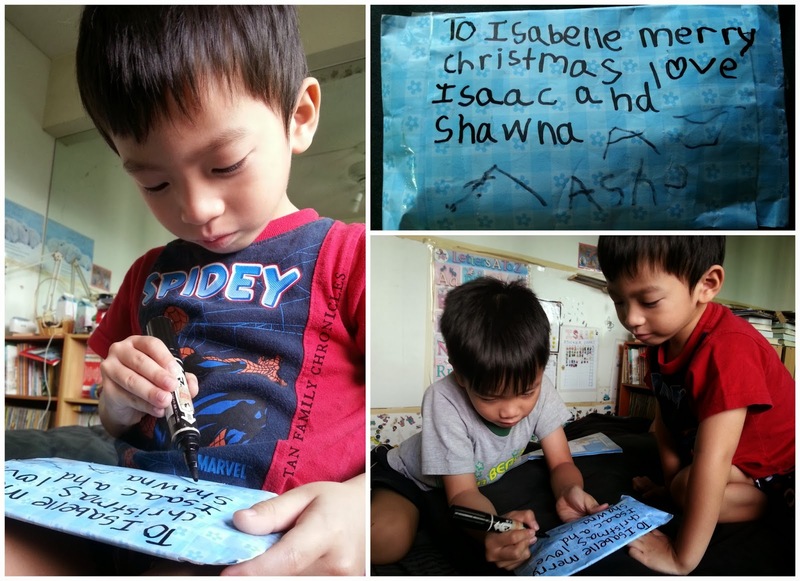 And only while I was taking the pictures of the gifts, did I realise that Isaac forgot to write Asher's name on the blue gift! So I went to Asher, and asked him to write his own name in. "Mum, I don't want to write 'Asher', I want to write Ash - coz it's so cool!" So he tried to write Ash but ran out of space and didn't know how to write on the sticky tape... Isaac to the rescue, again! "Let me help you, Asher! But you must write Asher, if not, Isabelle will wonder who Ash is." And so he proceeded to write Ashe- and was stopped midway the 'e' because Asher went "Noooooooo!!!! I want ASH, not Asher!!!" Isaac on radio! We won No Rhyme or Reason!! !